Muhammad Abu Khdeir: The Israeli government destroyed the homes of Palestinian murder suspects. Will it do the same to the homes of Jewish murder suspects? The Israeli government destroyed the homes of Palestinian murder suspects. Will it do the same to the homes of Jewish murder suspects? 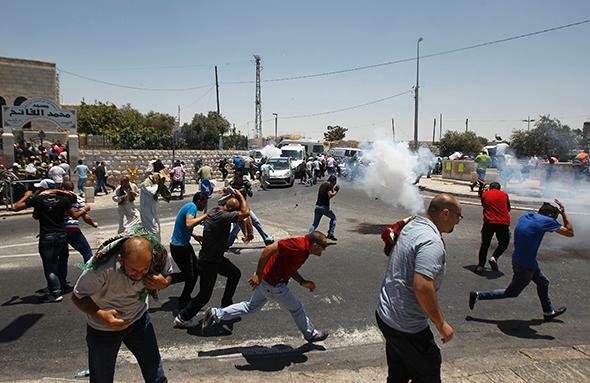 Palestinian protesters clash with Israeli soldiers after Friday prayers in the Arab East Jerusalem neighbourhood of Ras al-Amud July 4, 2014. To this, Muhammad’s parents have issued a simple challenge: Prove it. Demolish the homes of the Jews who murdered him. Demolition played a central role in the drama leading up to Khdeir’s death. According to Israeli officials, two West Bank Arabs, Marwan Qawasmeh and Amer Abu Aisha, kidnapped and murdered three Jewish boys on June 12. Israeli authorities haven’t found Qawasmen or Aisha, much less tried them. Nevertheless, on June 30, Israeli soldiers destroyed the suspects’ homes in Hebron. They broke windows, wrecked furniture, smashed sinks and toilets, and trashed kids’ bedrooms. Then they used explosives to blow out the ceilings and walls. Twenty people were living in Aisha’s house. At Qawasmeh’s house, all the men had been arrested, so the only people still there were women and children. Nine years ago, after hundreds of demolitions, Israel suspended this practice, conceding it had failed as a deterrent. Now, in the wake of the June 12 kidnappings, the practice has resumed. Qawasheh and Aisha aren’t the only targets. Last week, Israel’s high court approved the pre-trial demolition of another Arab suspect’s home, citing deterrence as the basis. The Israeli military is considering whether to destroy dozens of other West Bank homes, including those belonging to leaders of Hamas. The demolition policy is barbaric. It defies basic principles of innocence, humanity, and the rule of law. It’s also discriminatory. It has never been applied to Jews. On Sunday, Israel arrested six people suspected of murdering Khdeir, the Palestinian boy. Three have reportedly confessed and re-enacted the crime. One has implicated all the others. According to investigators, the suspects are Jewish extremists, they were captured on video, the crime was premeditated, and the motive was “nationalistic,” apparently to avenge the deaths of the three Jews. The suspects face prosecution for murder, conspiracy, racially motivated crime, and membership in a terror organization. The investigation has also linked them to the attempted abduction of a 9-year-old Palestinian boy. Khdeir’s parents point out that there’s a simple way to make good on these promises. “Destroy their houses just like [Israel] destroyed the houses of the suspects in Hebron,” says the boy’s father. “Demolish their houses and give them life sentences,” says his mother. Some Israelis are already concocting excuses for not applying the policy to Jews. Almagor, a 28-year-old organization that claims to speak “for terror victims’ rights,” says in its mission statement that every victim “is entitled to justice: punishment of the criminal, the psychological closure that comes with punishment, laying down the law in its full force.” But on Monday, in a letter to the Israeli government and members of parliament, the group’s director pleaded that while “we need to deter Palestinian terrorists by destroying houses and exiling their families,” Jews don’t need to be treated this way, because they seldom kill. As a Jew, I can’t believe I’m reading this. How can Israelis defend a policy that deliberately makes babies and old people homeless? How can they rationalize one punishment for Arabs and another for Jews? What’s the point of a Jewish homeland without a Jewish soul? Muhammad Khdeir’s parents have spoken the truth. Israel has two choices. Destroy the homes of the Jews arrested for his murder. Or renounce the demolition policy, forever.